Sunstar Motel is a unique motel, located in Muldraugh, KY. It is one of the most iconic and noticeable buildings in all of Muldraugh, and is situated on Dixie Hwy, next to a Fossoil gas station. The motel can potentially have large amounts of zombies wandering the area, making it somewhat dangerous. However, there is a large number of windows leading out of the motel which could provide the player with a quick escape if need be. The Sunstar Motel is a suitable location to spend the night, as it has an upstairs with two staircases and a number of rooms to sleep in, making it difficult for zombies to stumble upon the player while they're sleeping. Although this is an ideal temporary location, it is not recommended as a permanent safehouse, since it is situated in one of the main parts of town with multiple points of entry. Barricading this area would take a lot of time and materials, increasing the risk of death. There is a large variety of loot spawns within the motel. There are 2 sheds, which can contain metalworking items, electrical items and carpentry items. There is an industrial kitchen, which can have large amounts of food and cooking utensils. There are a total of 20 suites, each is likely to contain pillows, bath towels and sheets, although they will rarely have food, backpacks, and some medical supplies. A bathroom is connected to each suite, which could contain medical supplies, bleach, sheets and bath towels. 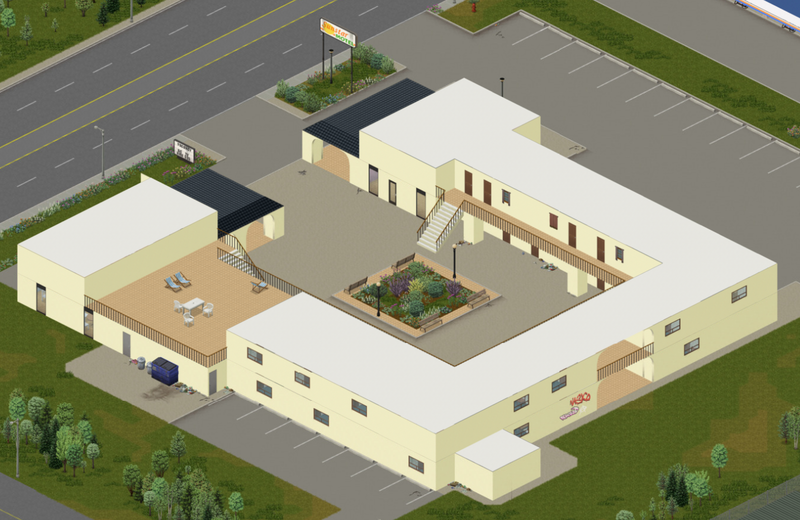 The Sunstar Motel has a total of 19 vehicle spawns, each within one of the parking spaces. Each spawn is chosen at random for and can be any type of vehicle, however it is more likely to spawn one of the standard vehicles. The Sunstar Motel is heavily based off the real world Golden Manor Inn & Suites located at 116 Dixie Hwy, Muldraugh, KY. The motel is also situated next to a gas station. Graffiti with the words NasKo and RingoD can be found on the East-side of the building. This is a reference to Paul Ring, the scripter and mapper working on Project Zomboid, and NasKo, the Community Manager. This page was last edited on 1 December 2018, at 04:45.